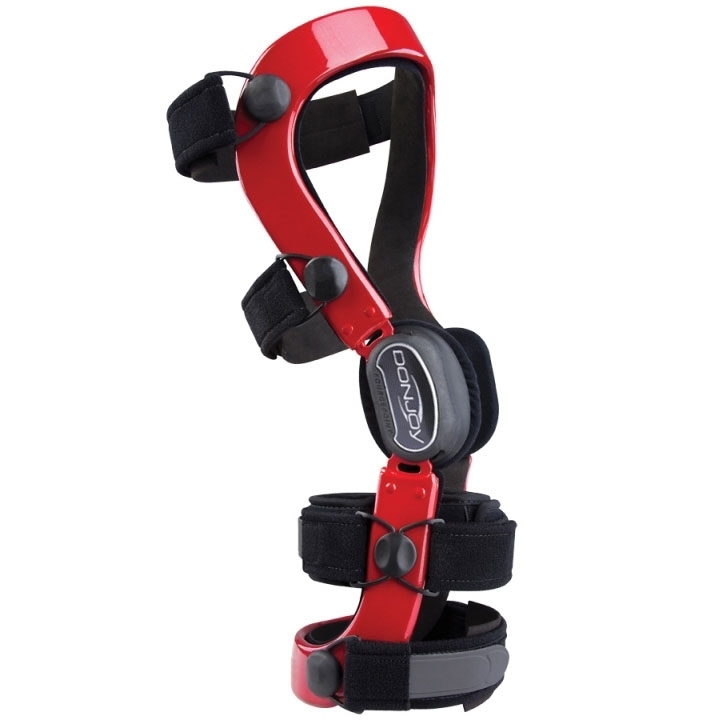 Shop custom knee braces by DonJoy®. Custom knee braces are custom-fitted to your knee to help provide the right fit and protection for your knee. Our custom knee braces are low-profile and light-weight allowing you to stay active without the bulk. 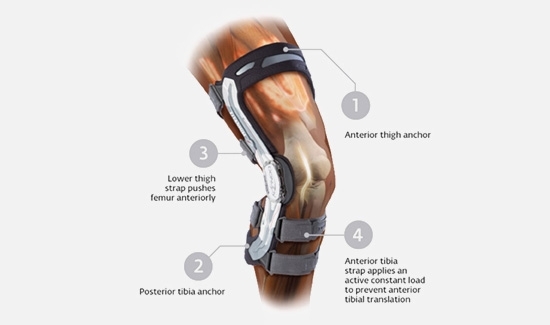 Should you wear a custom knee brace? Athletes looking for support and protection for moderate to severe ligament instabilities such as the ACL / PCL, MCL / LCL, and CI (combined instabilities) may benefit from a custom brace. 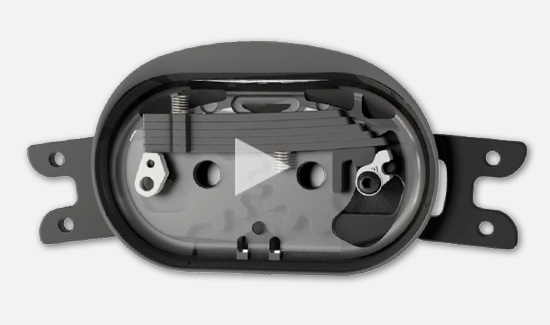 Our Fourcepoint™ Hinge Technology helps reduce the amount of the time your knee is at an "at-risk" position. Our two custom braces include the DonJoy® Defiance® III and the DonJoy® A22®. These knee braces are ideal for many sports like football, basketball, football, volleyball, and water sports. Note: Due to the customization of the Defiance® III and A22®, these custom braces are not eligible for general returns or the 30-day moneyback guarantee. This patented technology was developed to help reduce the strain on the ACL by distributing the load placed on the ligament via four points. The Fourcepoint™ design simultaneously dampens knee joint extension, improves the braces mechanical performance, and increases flexion angles. This reduces knee shear forces and decreases the overall strain on the ACL. How? The Fourcepoint™ Hinge utilizes a spring mechanism to apply a gradually increasing amount of resistance during knee extension. The resistance reduces the amount of time your knee is in an "at-risk" position by increasing the posterior load applied by the brace on the tibia. The resistance is adjustable with 5 different resistance levels to accommodate activity level and comfort. If a patient re-ruptures a reconstructed ACL while wearing a properly fitted DonJoy A22®, Defiance®, Armor FourcePoint™ or FULLFORCE™ within one year of purchase, DJO Global® will pay a surgical insurance deductible. Visit djoglobal.com for details and eligibility. Learn more about the Knee Protection Program. 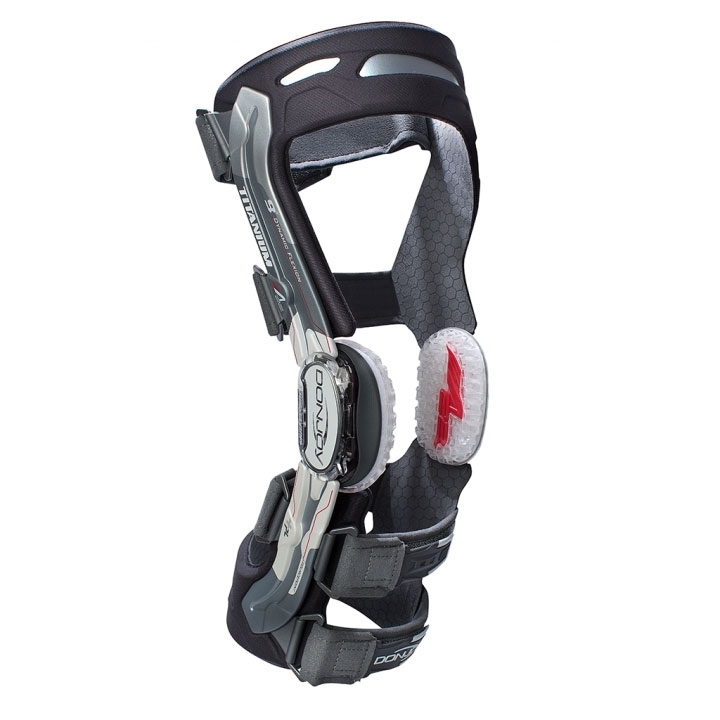 Recognized as one of our best ligament knee brace available. Ideal for ACL/PCL instabilities, CI (combined instabilities), MCL/LCL instabilities, OA and hyperextension. Ideal for athletes who participate in contact sports and want to help prevent a knee ligament injury or re-injury. Uncompromised engineering delivers the world's first titanium brace striking a balance of weight, strength and profile. Lightweight and streamlined, this custom knee brace offers ACL protection for non-contact sports. I have Defiance III's for both knees. After 30 years of playing hockey my knees would not fetch a plug nickel at a rummage sale. Both medial compartments have arthritis, the ACLs are barely hanging on, the meniscus look like a thin shag carpet with holes, and the MCLs are stretched. I wear them for hiking, rock climbing, skiing (both alpine and nordic) and work outs. They perform way beyond my, or my Doctors expectations. Three hour hikes in steep mountain terrain or a day spent climbing overhangs are not a problem. "23 out of 25 AP College Football Teams Use DonJoy®"
1. Beynnon BD, Pope MH, Wertheimer CM, Johnson RJ, Fleming BC, Nichols CE, Howe JG, Journal of Bone & Joint Surgery, Am. 1992; 74:1298-1312.